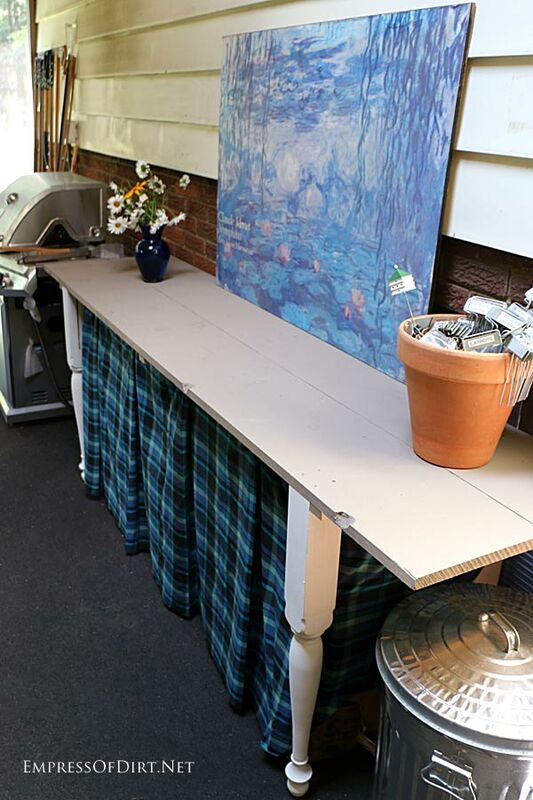 This project uses some old bedposts to create a garden potting table. For more, see the gallery of potting bench ideas. I’ve been wanting a potting table forever and when I found some long, wooden bedposts at the thrift shop for 50 cents each, I immediately thought: great legs! Here’s what I did. But first… my confession pile. I took the next photo a few weeks ago showing my junk/projects-to-be-completed-materials pile. There are old windows, a weather vane, garden art, shutters, chicken wire, parts from old school desks, scrap wood…. and, leaning on the gas grill, are the two bedposts. It wasn’t so bad in the winter, but now, in the peak of summer, it’s bonkers to have a beautiful, screened (and nearly mosquito-free) patio filled with junk. I’ve been working like a fiend to finally get some of these projects done. And, as you’ll see here, this space is now clear. Woot woot. I had a very specific look in mind: melding the sophistication of the bedposts with a rustic farmhouse look. I knew the back legs would not show, so I used 4x4s, which are nice and sturdy. I matched the potting table height with the grill, so they look good together and it’s just right for getting stuff done while standing. The table top is pine barn board. The joke, however, was on me. I intended to make this an entirely repurposed project, but accidentally used the aged barn when building our patio privacy wall (which you can see here). So I had to buy new wood. Silly me. I actually started with three widths of barn board, assembled the table, and then realized it looked ridiculously huge in the space. Plan B: I took apart the table top, removed one barn board, cut down the 1x2s to the right length, and reassembled it. My debate about whether it would matter if the screws going into the legs were visible in the table top lasted about 4.6 seconds. Heck no! The word rustic is code for: hack carpenter takes easy way out. And now that the table is complete, it really doesn’t matter. I quite love it. Because my plan to use my aged barn boards fell through, I opted to stain the table top. To recap, the table top is held together with 1x2s across the underside, and the tabletop is secured directly to the legs through the top. The bedpost legs are painted. The rest of the table was stained to match our wooden patio walls. If you just thought How boring! – my daughter (who helped me) agrees with you! But, as I’ve confessed with the choice of paint for the shed, for some reason I get really tired of bold paint colours and prefer to add punches of accent colours with other items that are easy to change. Here’s the finished table. I cannot begin to express how much I love it: I finally have a place to work on the patio. Plus, it’s the same height as the grill so it provides all the space I need for cooking there and serving food. The skirt is shirting fabric. I attached it using binder clips—my go-to solution for darn near everything. The Monet painting is a sentimental bit of kitsch from years ago. I got it when I was falling in love with my husband and it reminds me of all that wonderful electricity. Zap! The galvanized trash bin is my winter composter. I toss all my food scraps in there and they stay frozen until spring when I can put them in the proper pile. So what’s underneath? Bird seed! 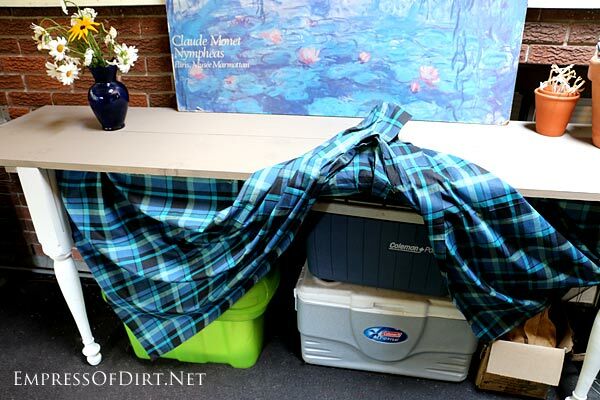 I keep it in old food coolers—perfect for keeping the critters out and the seed fresh. Love your idea of potting bench..plus all the storage behind the table skirt, but please fix that left table leg that looks like it is on crooked or fixing to collapse! It’s just how it looks in the pic. The table is very sturdy. Melissa, you did a fantastic job on your potting bench! Love the skirt below and the piece of art above! I’m going to copy your idea of using old coolers to store bird seed. Genius! Thanks, Jane. Those coolers are the most reliable solution I’ve found. Hope it works for you too. Ha ha – hard to find reproductions that stay true to the originals, that’s for sure! Hi Empress, love your crafty ideas. 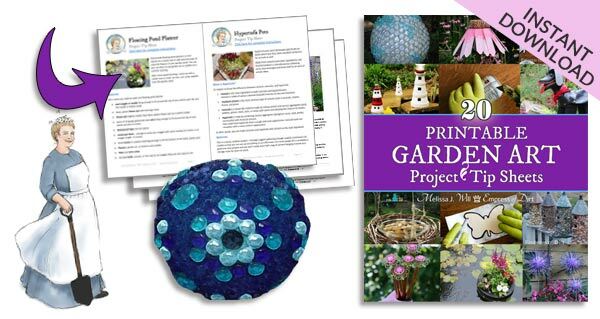 But wondering how much you had in materials for this project. Hi Vonna, Do you mean what I already owned? Great job Melissa..gives me an idea with an old door I have….OK..I’m guessing a potting shed with the windows..
I’d love to do a project with old doors. Your guess about the windows has been noted by the Royal Secretary. Great job on the new potting table that will also be a wonderful table for extra food, etc. when you have a family get-together! Great little potting table Melissa. I know what you mean about a pile of stuff waiting for project completion … I’ve moved mine a couple of times this year as the garage get sorted out. Hm-m-m old windows … wonder what that will be??? Hi Linda, We need more hours in the day!